I have two DSLR (Digital Single Lens Reflex) cameras. The older one is a Canon T3i from 2012. I didn't understand it at the time, but it's what's called a "cropped sensor" camera, meaning that the sensor that captures the images is smaller than a standard 35mm piece of film. The new camera, a Canon 6D from 2016, is a "full frame" camera, meaning that its sensor supposedly measures a full 35mm. Here's a mid-distance shot, focal length 36mm. It's our house taken from the neighbor's property across the road. I like the new camera a lot. Two of the three lenses I used on the old camera work on the new one. The one that doesn't is a 18-55mm zoom, the one lens I used the most on the old camera. I also got two new lenses for the 6D, a 25mm fixed and a 50mm fixed. They're less versatile, but they are higher quality lenses and I really like the images they take. Still, I miss the zoom lens for its ease of use. 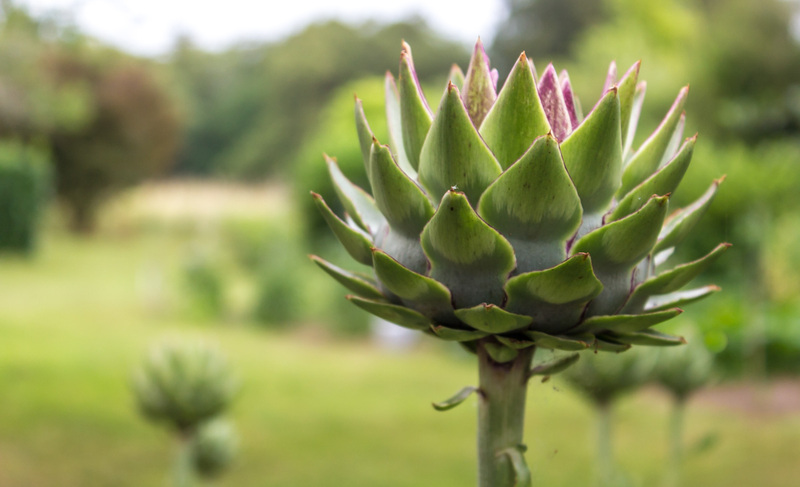 A close-up of one of our artichokes, focal length 46mm. I decided to try it out again, as part of the process of deciding whether to get a replacement that will work with the new camera. So I attached the zoom lens to the old camera and took a bunch of photos on my Sunday morning walk with Tasha. The lens is a "kit" lens, meaning that it's a lower-end lens that came with the camera body. My experiment is to see if I still enjoy having the zoom ability vs. having to change lenses and/or practice "sneaker zooming," the art of walking closer to or farther from the subject. 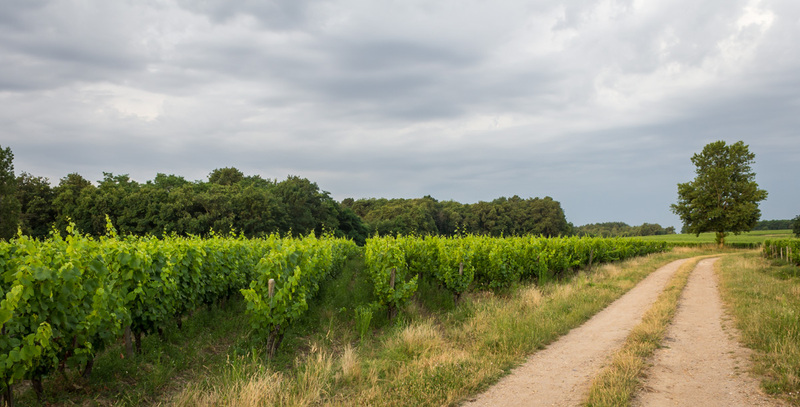 A long distance shot out in the vineyard, taken at a wider focal length of 21mm. If I decide to get a new lens, I'll check out used ones first. They're much more economical than new lenses. Either Amazon or Ebay will likely have some available. At least I hope they might. For the time being, here are some shots with the "old" camera and the "old" zoom lens. I'm not the photographic craftsman you are. It's always so wonderful to see the artistry and technical quality of your photos. I have an old Canon Rebel... is a XTi i had a Canon 40d .. its Middle Age... you mentioned a Canon 6d.... ... i have been toying with buying a Full Frame... Your photos are always amazing.... .. are they all taken with the Canon 6d???? Canon also sells refurbished lenses at a good price. Love seeing your photographs. I think the skill of the photographer is the most important factor. tommy, most of my posted photos since spring 2016 were made with the 6D, yes. wilma, thanks! I'll look into the Canon refurbished lenses when I start shopping.